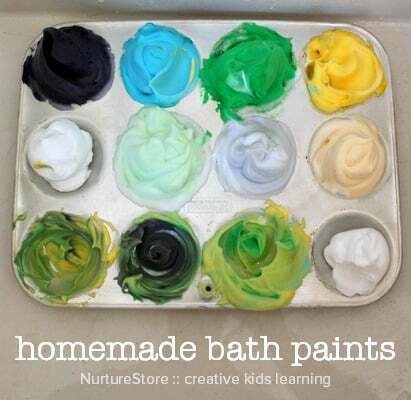 This homemade bath paint recipe has just two ingredients and you can make it in seconds. You could whip some up for bath time tonight! 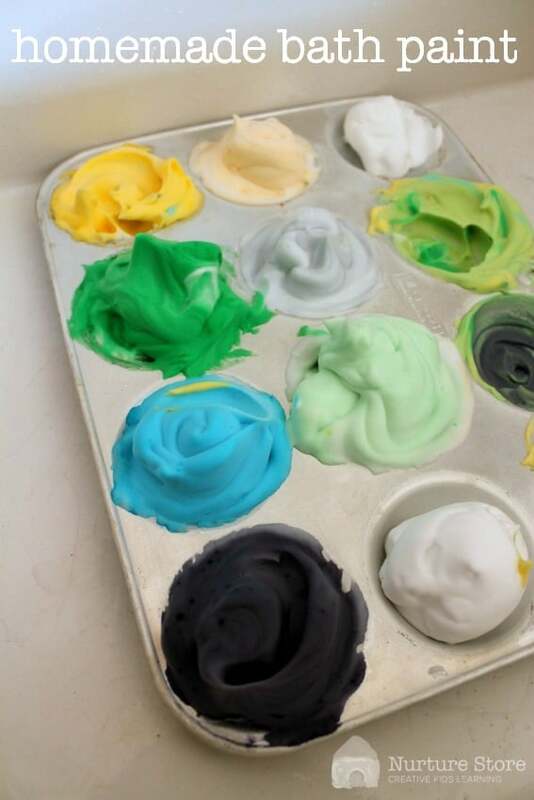 My daughter loves the texture of this homemade bath paint. 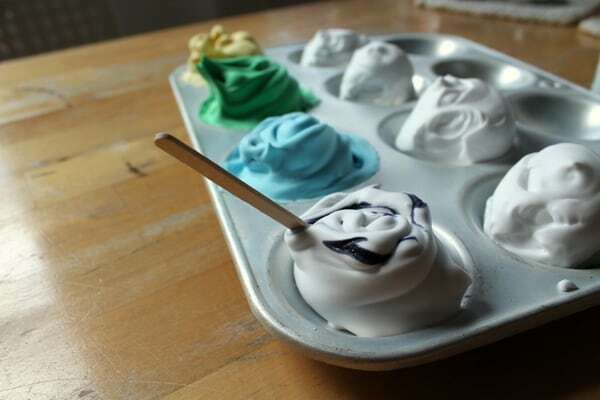 It’s so quick and easy to make, with just two ingredients: shaving foam and food colouring. We like to make it in an old muffin tin, which gives you a palette with a selection of colours. 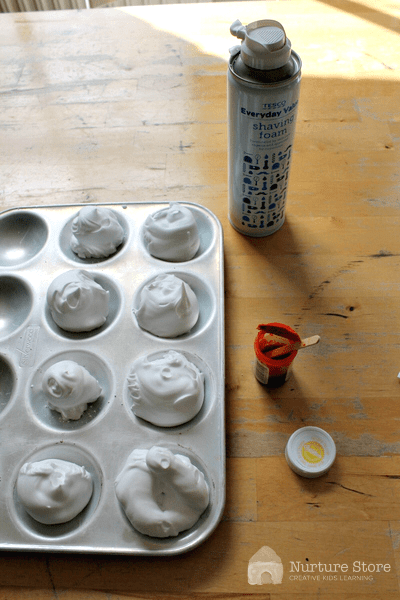 All you need to do to make the bath paint is squirt a little shaving foam in each space of the muffin tin, and then stir in your colour. I like to use food colouring gels, as you only need to use a tiny little bit of colour. And I like to leave a few spaces on the muffin tin palette empty, to encourage the children to try out some colour mixing of their own. You can play with this paint on a wipe-able cloth on the table, on the yard floor, in the sink, or in the bathtub. And as it’s made with shaving foam, clean up is very easy as you can just wash it all away. I have never had any of this homemade paint stain our bathtub, but I’d suggest you check out your brand of food colouring carefully just in case. hi, just wondering, are shaving cream safe for babies, as my boy is only 10 months old. Hi Maria. I would be cautious about using it with a young baby, as you will need to be certain he’s not going to put any in his mouth or eyes. 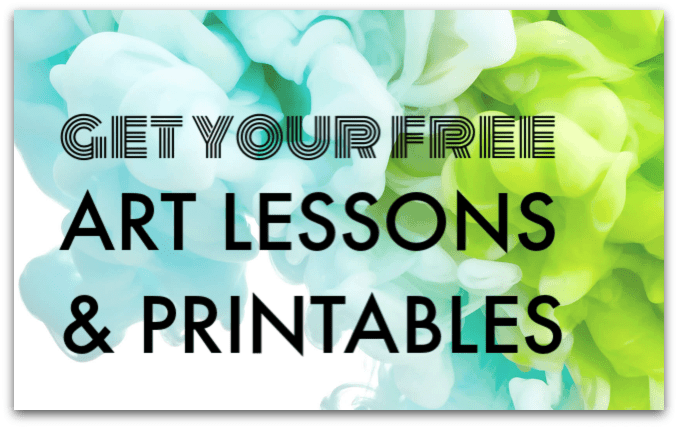 What about trying an ‘edible’ finger paint recipe instead? You can use cornflour/water, or yoghurt/pudding as the base. I have searched the net for ways to practice spelling in the shower. Reciting with background noise teaches my son to focus but he needed the visual as well. We are using the see it, say, write it method. And well this with calming water sensory learning is absolutely perfect!! Thank you!